Rhythm is something that is very important for every musician. I mean, you don’t have to be a drummer or ‘rhythm’ guitarist to feel the effects of bad rhythm. Don’t believe me? Well, I’ve seen so many students over the years nail a piece of music or lick totally note for note. Then, they play it to me and complain that it just doesn’t sound right. Maybe you’ve had a similar experience. They’re hitting all the right notes, and usually have the correct (or similar) tone. So what’s going wrong here? The truth is that ‘all the right notes’ just isn’t enough. You need to also play them at exactly the right time, too. Otherwise what you’re trying to play, and what you actually playing, are two different things. 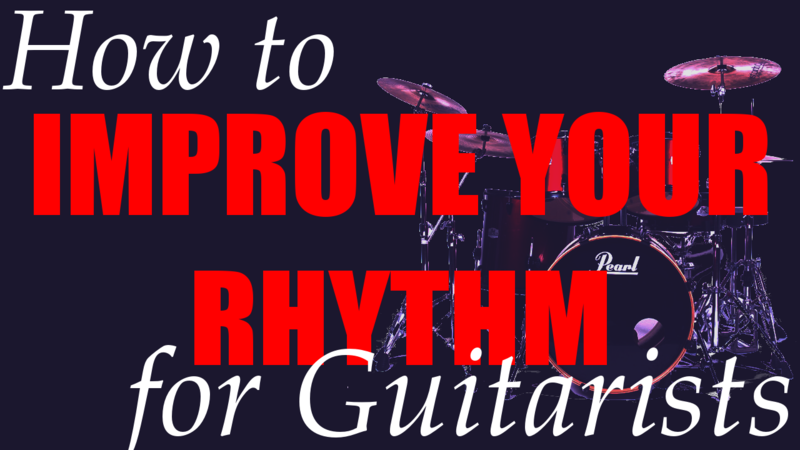 So, if you feel that your rhythm skills may be holding you back, read on! Also, if you think you’re already great at rhythm, prove it! Follow along with the exercises I do in the video, and then try creating some of your own. As I say in the video, the more different ways you can learn (or practise) something, the better. This sometimes means coming away from the guitar to work on musical skills separately from guitar skills. So, the following exercises work on different ways of practising rhythm. For best results, I recommend combining them in your practise routine. Some use the guitar, some don’t. Before you get excited, this isn’t going to be about the guitar technique. I find tapping along to things a great way to improve your rhythm skills, and you don’t even need your guitar with you. This means you can get this done absolutely anywhere. I suggest starting with a metronome, before moving onto real songs. When you get really good, you might not even need a track to tap along to- just using your internal rhythm as a guide. So, start by tapping either one foot or one hand to the beat. It doesn’t matter which hand you use, but your dominant hand (right for right handed etc.) is probably easier at first. Then, try doing it with your other hand instead. This will help build a connection between things you’re doing, and the beat itself. Next, try moving on to various subdivisions. That’s a pretty long word, but all it really means is that you play different numbers of notes in between the beats. You’re dividing the beat between more notes. An easy way to start off with this is to alternate between your two hands (or feet). So one hand taps on the beat, and the other hand is tapping in between the beats. Try to keep the rhythm of what your two hands are doing fairly consistent. If you’re tapping both hands in quick succession, and then there is a long gap, you’re doing it wrong. Once you’ve got the hang of two ‘taps’ per click, try more. For example, four notes per click is exactly twice as fast as two. It might also be helpful to use a four syllable word to say on each beat (something like ‘coca-cola’ would work…). If you’ve kept up so far, or you’re still finding it easy, then we can always, always make things more difficult. If not, then feel free to keep practising the stuff so far. It’s much more important that your rhythm stays in time, and a complicated rhythm is nothing if it isn’t in time. So, practise the basics before moving on. I already mentioned using words to get the right rhythm. If you can find a word with the right number of syllables and say it for each beat, it usually gives you a steady rhythm to work with. I’m sure you get the idea: the rhythm of the word is the same as the rhythm you’re trying to play. However, if you feel a bit silly saying ‘penguin, penguin, penguin’ as you practise the rhythm, you could also just count. Either count the subdivisions in each beat, or count the beats themselves. That means either counting ‘1 2, 1 2, 1 2’ instead of saying ‘penguin’, or counting a number on each click (‘1 2 3 4, 1 2 3 4’ etc.). This last one is probably the most tricky. As I explain in the video, pick a lick (or song) and play it to the metronome. Then, half the speed of the metronome, so that it only clicks on beats one and three. If you can play with the metronome on beats 1 and 3, why note try setting it to beats 2 and 4? Again, you’re still playing at the same speed, only the metronome is now only clicking on the second and fourth beats of the bar. This means you’re probably starting your lick between clicks, instead of on a click. There are many more things you can do to help your basic rhythm skills. In the video I explain how to apply this to the guitar. However, we’re working on having a good overall sense of rhythm, here- which is something that is important for musicians in general.